NOTE: This macro doesn’t work with Dropbox 2 anymore because it uses the “Find Image On Screen” action! I’m working on an update, but I would also much rather not want to rely on finding an image anymore, which means I need to investigate other ways to pause/unpause Dropbox. When I’m done though, this macro will work much more smoothly! Here’s a macro to pause and resume Dropbox on your Mac using Keyboard Maestro. In order to get this working on your machine, you have to do some customization though, because I’m using a rather tricky setup. The problem is that Dropbox has no AppleScript dictionary, so there’s no AppleScript way of pausing/resuming Dropbox1. The macro uses Keyboard Maestro’s “Find Image on Screen” capabilities to look for the Dropbox icon. If it looks a certain way, the mouse cursor is moved there, clicked and then the letters pause or resume are typed out with a slight delay in between each letter2. If you want to use this, you should paste your own two Dropbox sync state icons in two places. Then take a screenshot again when the app is paused. Open the image in an editor or Preview. Crop it down to the size of the icon only. 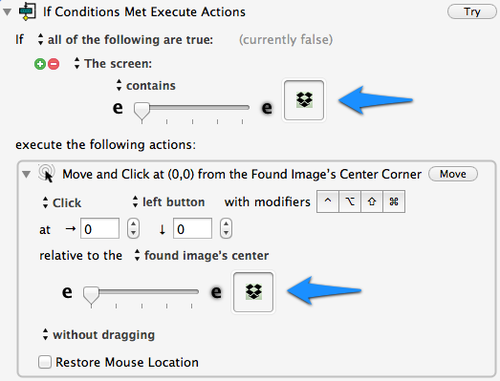 Drop the cropped screenshot onto “If Conditions Met Execute Actions” and “Move and Click at …”. The macro has two if statements to find either Dropbox’s idle icon or its paused icon on screen, which is then used to act accordingly. The macro could be much faster if Keyboard Maestro didn’t have to search for the image twice. I haven’t found a way to make this easier. All my attempts failed. In any case I figured why not use “Find Image on Screen”? It’s a cool feature. I suggest to set a custom shortcut for yourself. It is set to ⇧⌃F12 at the moment.